First off, I was able to pick this up on sale. I think at the sale price it's a Steal! but had I paid full price, I would give it a Good Deal rating. I rated it 4 stars because I do work up a some sweat from time to time. I tend to ride on the warm side so for many people it probably won't be an issue. For the Pacific Northwest (PNW), it's a great jacket covering 7-8 months out of the year. I would say if you can only afford or want one arrow in your quiver, this should be the one. It will cover down to the coolest temperatures we see in the winter to the median temperature for our region during the winter months. Mid 20's (-4 C) to low 50 (10 C). It does a great job shedding the drizzle to light rain which is what we have most of the time. Only in the hardest rain would I go to a true rain jacket. It's my go to jacket when it's overcast, damp and temperatures are from mid 30's to mid 40's. That is a typical winter day in the PNW. I can wear a light short sleeve jersey or UA Heat Compression short sleeve shirt and stay very comfortable. No longer do I spend time trying to figure out what to wear for the ride. Now it's just a short sleeve jersey and the Alpha ROS Jacket. Depending on the type of rideworkout, I might work up a little sweat but nothing to the point were it becomes uncomfortable. For sizing I bought a Large. I am just under 5'9' (175cm) and weigh 145 lbs (66 kg). The fit is perfect with a race cut short sleeve jersey underneath. I have not tried a long sleeve jersey but I have plenty of room in the arms so I'm sure it would work fine. The body is snug but not too snug to where it is uncomfortable. Sleeves are plenty long so they don't ride up when riding in the drops or on the hoods. When I start to feel myself getting warm, I can unzip the liner which really helps to regulate temperature. Back pockets are deep and easy to access. So far so good! In the past I wasn't willing to spend this much for a jacket, but years of winter riding and not finding a kit that I have confidence in to keep me warm & dry in a range of conditions motivated me to try something new this year. After a lot of researching options I decided to give Castelli a try. After a month of winter riding in a range of temps and terrains and getting caught in the rain once, I love this Alpha RoS jacket. First impression was the fit. It's form-fitting, stretchy, and lightweight, blurring the line between a jersey and a jacket. The look & feel is like it's custom-tailored, perfect fit, no excess fabric anywhere, attention to detail that's a step above any other brand I've worn. 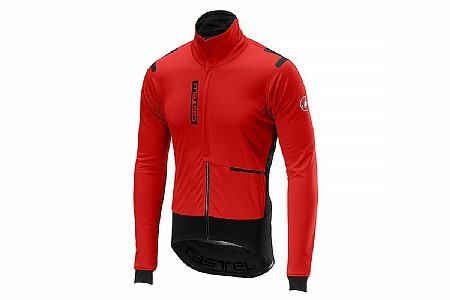 OK I'm sold on Castelli fit the moment I first put it on, but hard to believe this will keep me warm riding in 30's temps. But it does. This thing is a marvel of garment technology. It blocks the wind & insulates enough to keep me comfortable down to 28-30, and at the same time breathes & vents moisture like a much lighter garment. A couple of rides started in the 30's and ended in the 50's, and comfortable all the way through, no need to even unzip. Got caught in the rain, and watched the water bead and roll off. This isn't a all-day rain jacket because water will eventually get in around the neck & cuffs, but it kept me dry & warm for 2 hours in light rain & cold. No more worries about hypothermia if I get caught in a winter rain. To take care of my legs too, with the Alpha RoS jacket I also got three different Castelli bib tights to cover the full range of temps. The jacket with my Sorpasso 2 Wind bib tights is awesome from high 20's through 40's. On slightly warmer days, 40's & 50's, the jacket is perfect with my Nanoflex Pro 2 bib tights. One small complaint with the jacket is that even on dry days everything in the rear pockets gets soaked. Apparently the perspiration moisture that efficiently vents through the jacket condenses inside the pockets where it's colder. So I have to put stuff in ziplock bags. Since the jacket shell vents moisture so well, the pockets need to vent better to allow the moisture out. This is such an awesome jacket though that it's a minor issue. For sizing, I suggest ignoring the Castelli sizing chart. The jacket and bib tights are a full size smaller than most brands. I'm 5'9, 155lbs, and normally wear size M. This jacket and the bib tights are all L, and they're as tight as the snug-fitting M kit I own. If I gained 10 lbs I'd have trouble getting into the jacket or tights. Order a size larger than you normally wear, and keep in mind that the Castelli cut is for a slim build, no extra volume built into the middle like American brands. I gave one star less for Value just because it's pricey, but it's worth the premium and Castelli is my go-to brand going forward.